I thought i'd write a fresh intro to the Naming the Moment process looking at it from the point of view of community development. Naming the Moment is a popular education method for doing social change and community development work. Change happens in society both incrementally (e.g. through institution-building, education, etc.) and suddenly when there is a conjuncture of various forces (political, economic, ideological, etc.) in a moment of crisis. (Naming the Moment sprang in large part from a process known as conjunctural analysis developed from the work of Paulo Freire, Antonio Gramsci and others). Naming the Moment is a means by which people can learn to “read” these conjunctures (and the flows of forces that lead to them) and to predict to some extent the occurrence of and nature of such conjunctures. 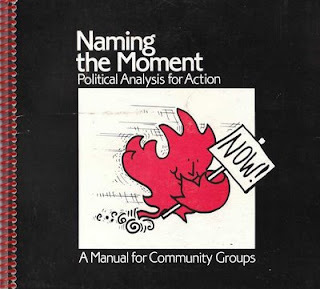 Naming the Moment is a popular education method and thus a participatory and collective approach to learning that is based on social justice values and anti-oppression principles; it explicitly resists oppression and any unjust use of power; it seeks to build solidarity amongst individuals and groups resisting oppression; and it is a form of capacity-building for groups and individuals. It typically involves groups of people who share, in common, either geography, class, work situation, or some other form of identity (or set of these) and who therefore have the possibility of collective action to change the world in which they live. Popular education resists the structures of learning and teaching that create authoritarian experts and passive non-experts. Through democratic dialogue and using a diverse set of means of creating knowledge (e.g. talking, of course, but also including the use of art forms such as drawing, murals, ‘zines; popular theatre forms such as skits, sculpture, sociodramas, Theatre of the Oppressed; structured learning exercises of many kinds, etc.) popular education puts the tools of resistance into the hands of so-called ordinary citizens. It is a means of sharing power or practicing “power with” and of resisting “power over” as Starhawk suggests. Naming the Moment has four steps or phases: Naming Ourselves, Naming the Issues, Assessing the Forces and Planning for Action. Each of these represents distinct goals and objectives for the collective work of sharing and analyzing experience and knowledge. Naming the Moment is a dynamic process that grew from roots and connections between Canadian and Latin American educators. Developed within the Moment Project and led by Deborah Barndt (a ten-year effort within the Toronto-based Jesuit Centre for Social Faith and Justice) it has continued to evolve as has its cousins in Latin America. The Catalyst Centre, a popular education worker co-op in Toronto, has developed Naming the Moment by identifying and naming previously implicit steps creating a seven-step process dubbed Seizing the Moment. The steps include: Setting the Stage for Democratic Communication, Naming Ourselves, Naming the Issues, Crafting Meaning, Planning for Action, Taking Action and Evaluation. In Latin America – Mexico, Peru, Nicaragua, et al – a similar process has been developed and is called sistematizacion. A difficult word for English speakers and difficult to translate as well, nonetheless, the concept of systematizing knowledge is one that is also key to Naming the Moment. Systematizing is a crucial aspect of popular, participatory processes that desire to have positive impact on the world, i.e to advance positive social change. The strength of popular education participatory processes is the success these have in drawing out people’s experience, sharing this in a creative and even compassionate manner and affirming the struggles that individuals undergo. Not surprisingly, this is also the weakness of participatory processes. A common mistake is to facilitate a wonderful sharing of experience and to leave it at that. This is called go-aroundism: everyone gets their few minutes, shares their two cents, it gets noted on flip chart and then the facilitator thanks everyone for coming and the meeting adjourns. Lacking here is the struggle to identify patterns in experience (allowing for agreements, challenges and dissent), to explain those patterns, critique them and then to negotiate and affirm those patterns that are consistent with our values and resist those we deem oppressive. This identifying and explaining of patterns is nothing less than theory-making. However, to call it this often relegates this practice to the domain of academics and intellectuals. Popular education processes recognize that everyone makes theory all the time. Anytime we answer the “why” of things, we are venturing into theory-making. Popular education recognizes that theory can be made through dialogue (i.e. democratically, critically, creatively). But more than that, when we make theory this way, informed by social justice values, anti-oppression and anti-colonial politics, we make better theory! Finally, this theory-making need not happen only in the halls of academe, far from the messy and noisy streets of our lives, but can happen – in fact, MUST happen – in the midst of life. This is what Naming the Moment and sistematizacion is all about: the making of transformative theory from the raw material of shared experience and collective knowledge and doing this within the messy challenges of life (including feeding each other, providing daycare, licking envelopes, making phone calls, providing assistance to those who need it in order to participate, and so on). Systematizing means that we do not simply accept everyone’s understanding of their own experience as the ultimate truth of that experience. If we are going to find patterns that connect and that can change things for the better, then sometimes we need to challenge each other’s understandings (even of our own experience). Doing this with compassion and respect is a fundamental popular education ethic. A key challenge is to move from the simple collection of anecdotes to the systematizing of that experience in order to tell the stories of those patterns that connect. Systematizing isn’t merely a fancy word for theory-making. It is democratic and participatory theory-making for social justice. But, as noted, sistematizacion is a mouthful for an English-speaker. It’s not a word that runs trippingly off the tongue. Nor does conjunctural analysis help matters much. Thus the phrase “Naming the Moment” which has the advantage of being understood quickly in a common sense sort of way. But it also acts as a powerful metaphor and statement of intent: one goal of Naming the Moment is precisely to identify the patterns of change and to name what is going on such that it can be changed: name the moment, as it were. The Catalyst Centre’s development of Seizing the Moment merely fills in some of the pieces, locating the original four phases of Naming the Moment in the more complete cycle from planning and preparation to implementation (of whatever actions were developed) and evaluation. Seizing the Moment also encourages a stronger action footing than “naming” suggests. So what’s this got to do with community development? A popular education approach to community development has several distinct advantages and at least one very powerful (and often deal-breaking) disadvantage. First, the disadvantage: it takes time. A popular education approach to community development takes a great deal of time. And the structure of society, the structure and availability of funding, the urgency and magnitude of the work that needs to be done, most often compels organizers, activists and agency personnel to seek faster more expedient solutions. Put quite simply, a democratic and participatory process of social change that treats with equal value the means and ends is one that needs time. Information can be shared quickly - and all the moreso in our hyperspeed, hyoer-wired world. Learning, however, takes time. The advantages of this approach are numerous especially given that it accomplishes a number of things simultaneously: relationship building, collective analysis, theory-making, policy development, skills training, and much more. It is community development for the long haul.